The same former officials accusing President Donald Trump of selling out to Russia failed to effectively counter in 2016 what they later claimed was a major Russian threat to American democracy. 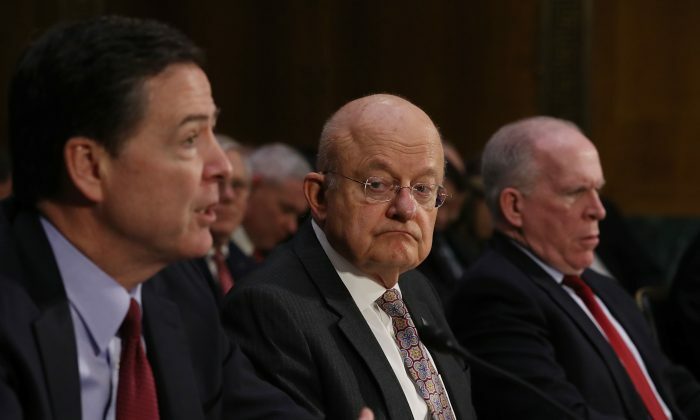 While predictably vocal about Trump’s signs of comity toward Russia, the former Obama administration officials were well aware of various forms of interference attributed to Russia before the 2016 presidential election. Yet they failed to stop it or at least adequately respond to it, as some former Obama officials later acknowledged under oath. Trump met with Russian President Vladimir Putin in Helsinki on July 16. At a press conference after the meeting, Trump laid blame on both countries for their poor relationship. Trump said the relations have been damaged by the still unsubstantiated allegations that his campaign colluded with Russian election interference. Trump also acknowledged that Putin denied the meddling. Former officials of the Obama administration jumped on Trump’s comments. By “the server” Trump meant the email server of the Democratic National Committee (DNC), which, according to a recent indictment by Special Counsel Robert Mueller, was hacked by Russian operatives. Comey testified to Congress in June last year that the DNC had refused to give the FBI access to the server, despite multiple requests. Trump placed the blame for interference with the previous administration’s failure to protect against Russian activities and said his administration will move aggressively to repel any efforts to interfere in the 2018 election. “We’re doing everything in our power to prevent Russian interference in 2018,” he said in Tuesday remarks at the White House. He said the Obama officials only mounted action against the Russian interference after the election was over. While the Obama administration did more than nothing, it wasn’t enough, according to two former officials deeply in the know. The administration was aware of hacking activities related to the election and attributed to Russians as early as 2015, according to congressional testimony from Victoria Nuland, Obama’s assistant secretary of state for European and Eurasian affairs. Those options remain largely classified, but “spanned the full gamut of U.S. power, including diplomatic, intelligence, law enforcement, economic, and cyber activities,” said Michael Daniel, former National Security Council cybersecurity coordinator, who participated in the effort and testified alongside Nuland. Among the options was the “use our cyber capabilities to impose costs on the Russians both openly, to demonstrate that we could do it, as a deterrent, and also clandestinely to disrupt their operations as well,” Nuland said. But in late August, Obama’s national security adviser, Susan Rice, called Daniel to her office and told him to “knock it off,” Yahoo News reported. “I was incredulous and in disbelief. It took me a moment to process. In my head I was like, ‘Did I hear that correctly?’” said Daniel Prieto, one of Michael Daniel’s top deputies. “Why the hell are we standing down? Michael, can you help us understand?“ he recalled saying. Daniel confirmed in his testimony the accuracy of Prieto’s portrayal of the meeting. Daniel said they were told the administration was afraid their work on the countermeasures would be leaked. They were told to work on securing the local election systems instead. In the end, the only deterrent action from the administration was Obama’s warning to Russian President Vladimir Putin during the September 2016 G20 summit. The administration’s actions were inconsistent with Nuland’s understanding of how the Russian government operates.